Ever craved a juicy Ramly burger but there’s no nearby pasar malam? 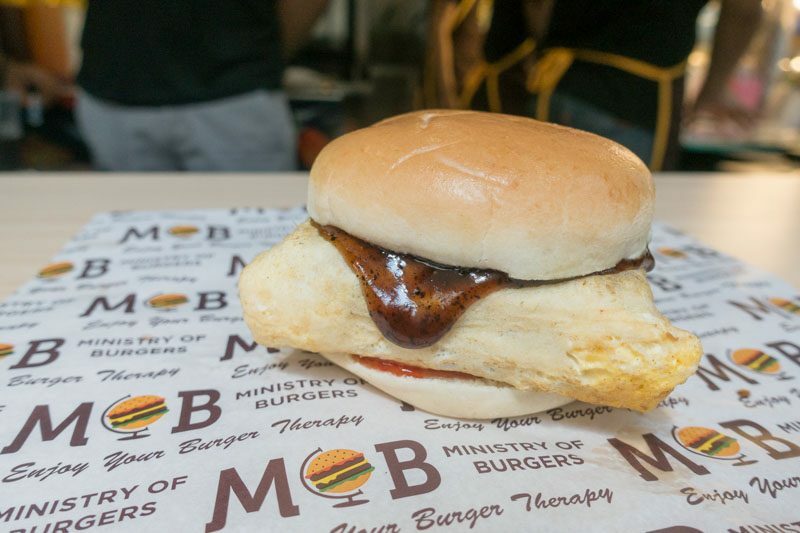 Try Ministry of Burgers, an eatery housed along White Sands at Pasir Ris that specialises in Ramly burgers. 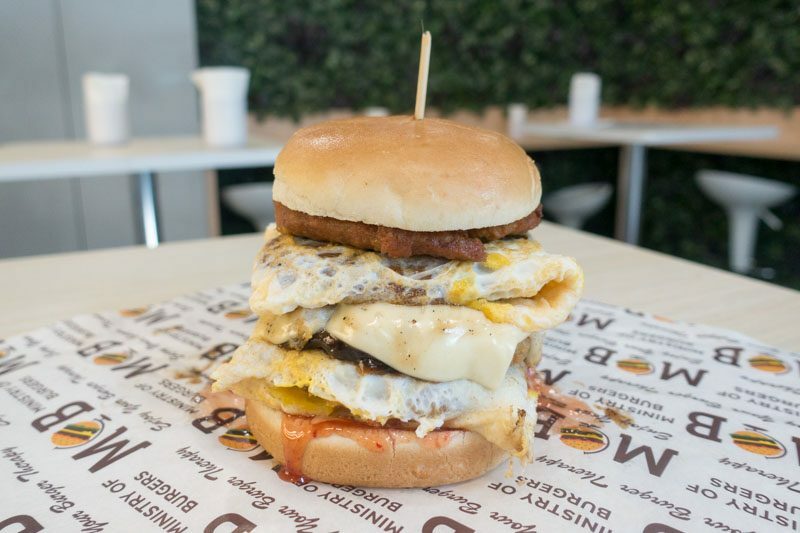 If a regular one-patty egg-wrapped Ramly burger isn’t enough for you, you can get a towering four-patty burger for just S$9.90! 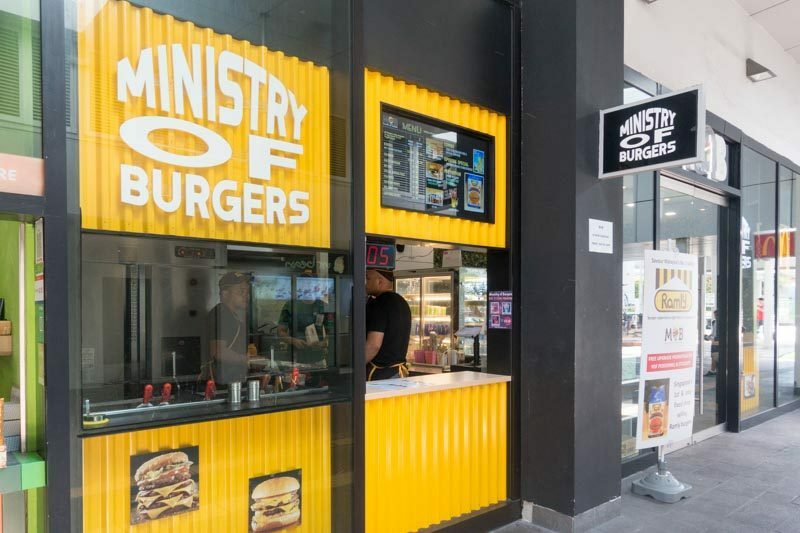 You can’t miss Ministry of Burgers. It’s located at White Sands Shopping Centre and if you’re taking the train, it’s right at the Pasir Ris station exit. Plus, the takeaway kiosk is painted a bright yellow with the shop’s name and logo in a huge visible font. With four standing tables and a row of high seats facing a gorgeous leafy wall, it’s perfect for snapping a pic for the ‘gram. The first thing we ordered was the Thunder Burger (S$9.90), a whopping four-patty Ramly burger. The four patties are completely customisable, so you can choose between Veggie (a soy-based fried patty), Chicken, Beef or Fish. Two of these patties will be wrapped in egg. 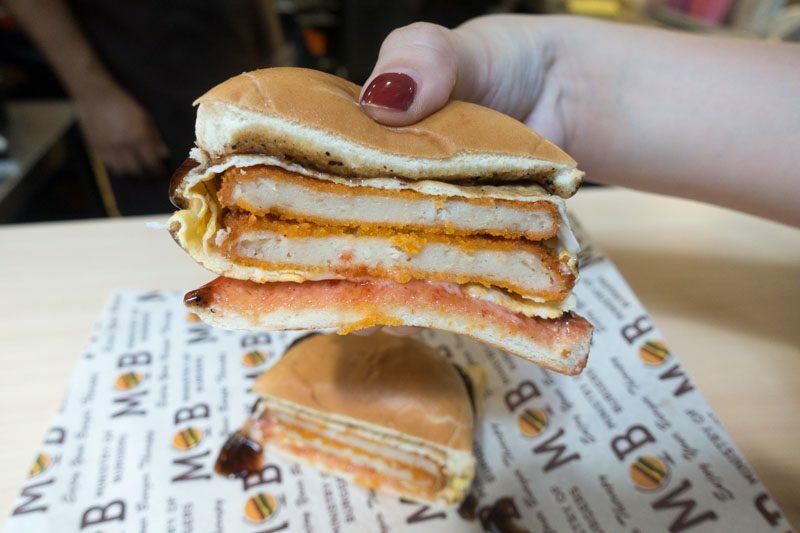 For our towering burger, we chose two chicken and two beef patties, with one of each patty type wrapped in egg. 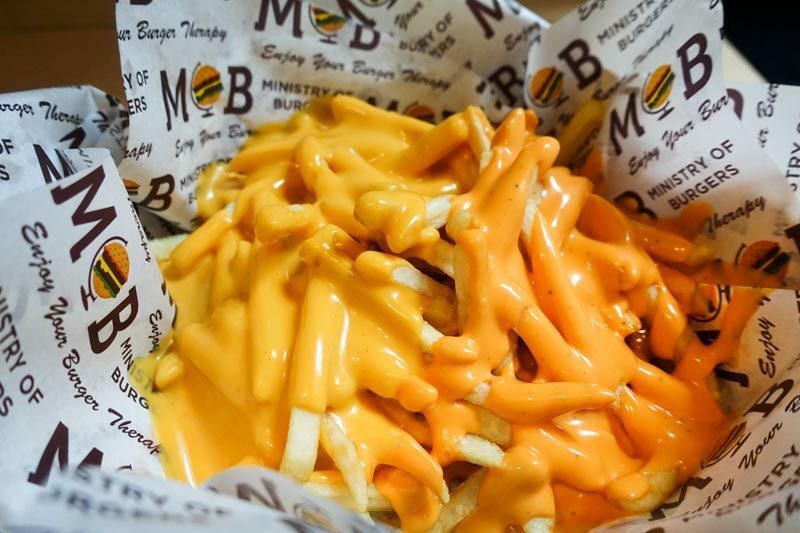 We also topped it up with a layer of melted cheese for S$0.80, because who can say no to gooey cheese? I’m not kidding when I say this burger was huuuge. Holding it up with one hand was tough, and I had to split it in half to share with my dining companion. 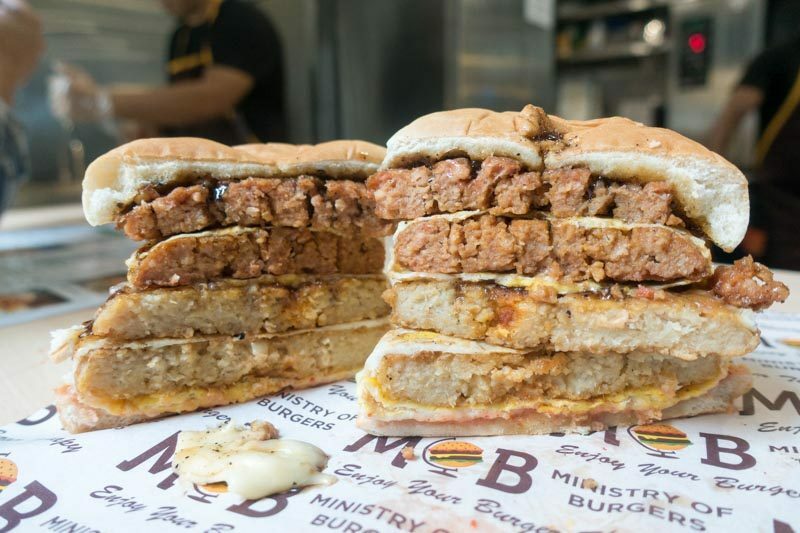 Ministry of Burgers uses custom 80g patties in the burgers, which are thicker than the usual 65g pasar malam Ramly patties. Talk about humongous! 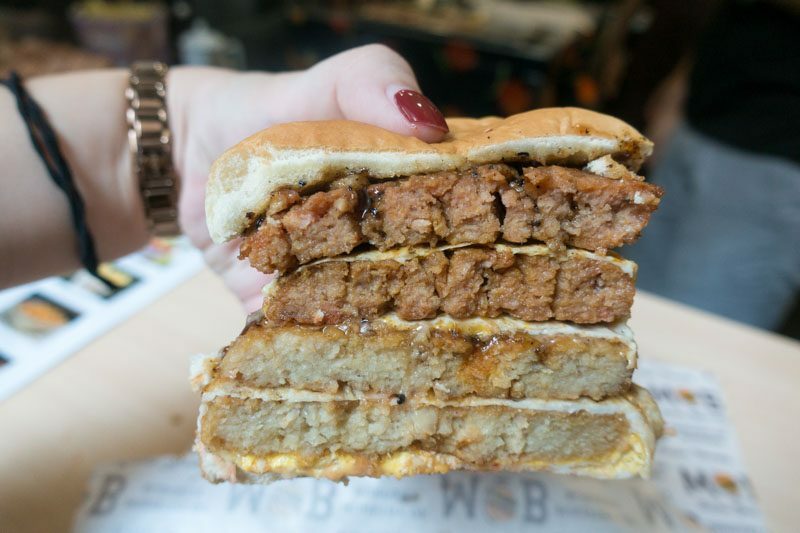 Fair warning, there’s no way you can eat this burger without making a mess. There were generous layers of chilli, mayo and black pepper sauce, which made the buns a little soggy. Considering its size, you’d think that it would end up being jelak, but I was actually surprised at how good it tasted. The patties were deliciously juicy but firm, and slightly crispy on the outside. Melted and stringy, the cheese added a gooey layer of savoury goodness. The paper-thin eggs were light and slightly runny, and the butter-lined buns were sweet and fluffy. I also loved how the black pepper sauce gave a tinge of spice, and the slight heat cut through the meat. We also tried the Special Biryani Fries (S$2.50). 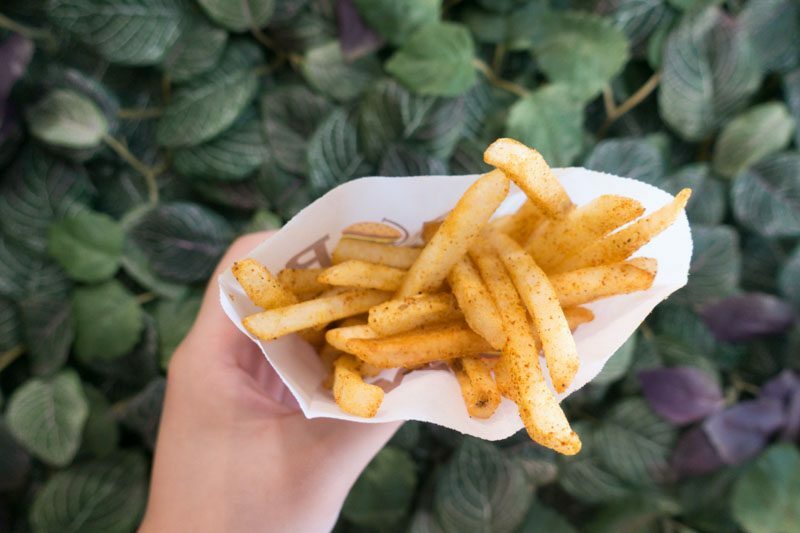 These regular shoestring fries came with a special house-made seasoning that’s supposed to mimic biryani flavours. 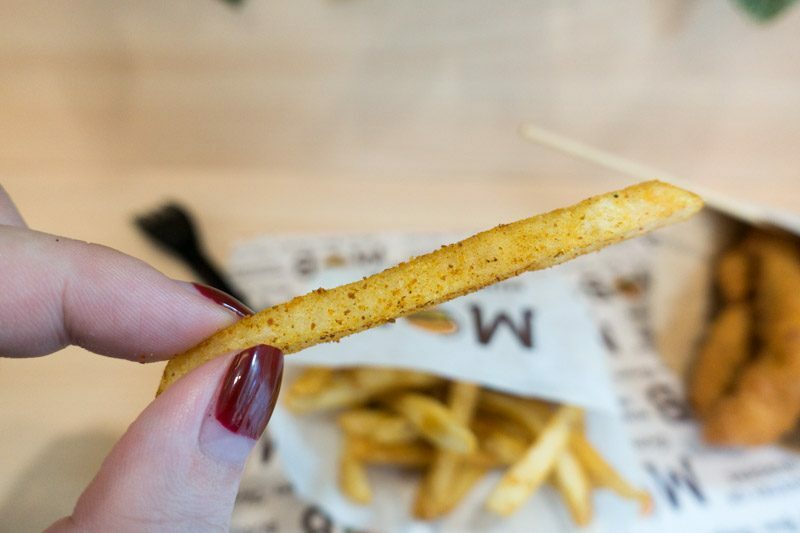 When I first bit into the fry, I tasted a mix of cinnamon, turmeric and pepper. While it was no doubt aromatic and there were definitely plenty of spices used, it didn’t immediately remind me of biryani. However, the more I tasted it, the more I associated it with the fragrant spiciness of biryani. I could taste notes of star anise, saffron, ginger and garlic. The fries were so addictive that I actually finished the entire packet. Next, we tried a regular pasar malam staple, a two-patty Fish Burger wrapped in egg (S$5.90, +S$0.80 for egg). What I really liked about this double-patty fish burger was how well-cooked the fish fillets were. Freshly fried on the grill and tucked into a thin, crepe-like egg layer, the fish fillets were warm and crispy. There was even an audible crunch when I bit into the burger. Though the sauces made the bottom bread layer soggy, I absolutely loved the black pepper sauce. It was sweet and tangy, almost honey-like in texture, with large granules of ground black pepper. 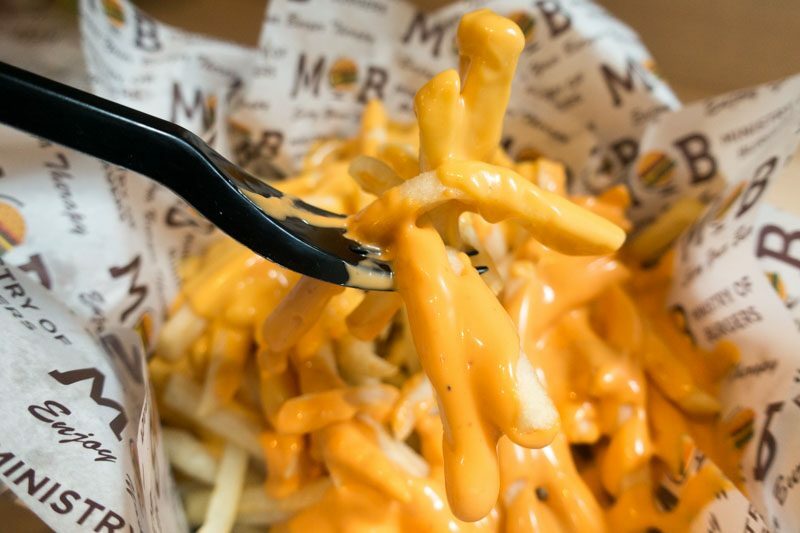 The Volcano Fries (S$8.90) from Ministry of Burgers was a massive pile of shoestring fries, topped generously with cheese and chilli mayo. The portions were huge, so be sure to share this with a friend or two! While the shoestring fries were pretty nondescript, I loved how classic and indulgent this side dish was. The cheese was gooey and warm, and tasted similar to the kind used with nachos with a sweeter slant. The mix of chilli mayo certainly added a fiery and piquant touch to the creamy cheese. As for drinks, we tried Ministry of Burger’s Red Singapore Lightning (S$5.90). It was a tropical-flavoured soda drink with fresh mint and lemon slices. Plus, it came equipped with an LED bottom so it literally was flashing colours! While it tasted like coconut and raspberry, it also had a strong syrupy texture which I wasn’t extremely fond of. Given the soda-like taste and its flashing lights, it’ll be a huge hit with the kids. This drink was also available in four other flavours: The Singapore Lightning (vanilla), Blue Singapore Lightning (rose), Yellow Singapore Lightning (mango), and Green Singapore Lightning (lychee). All five flavours are priced at $5.90. 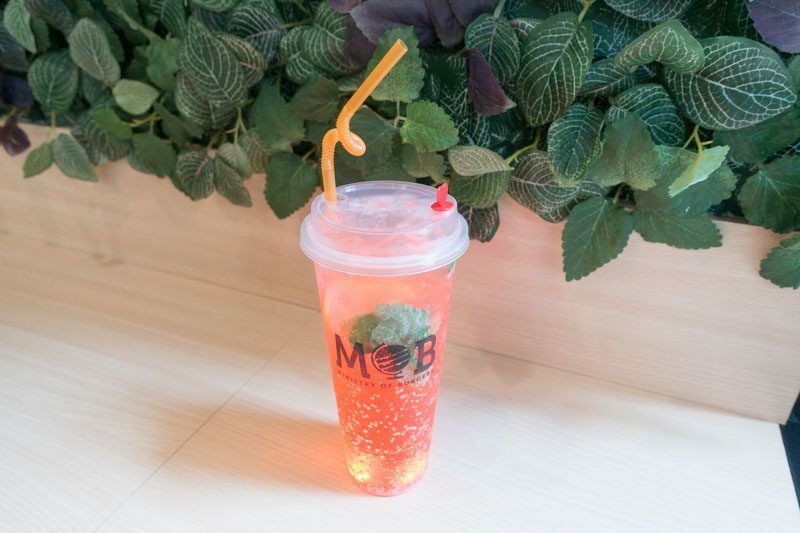 All combo meals come with the MoB Refresher, a special lemonade drink by Nestle. I quite liked how refreshing and simple this drink was. 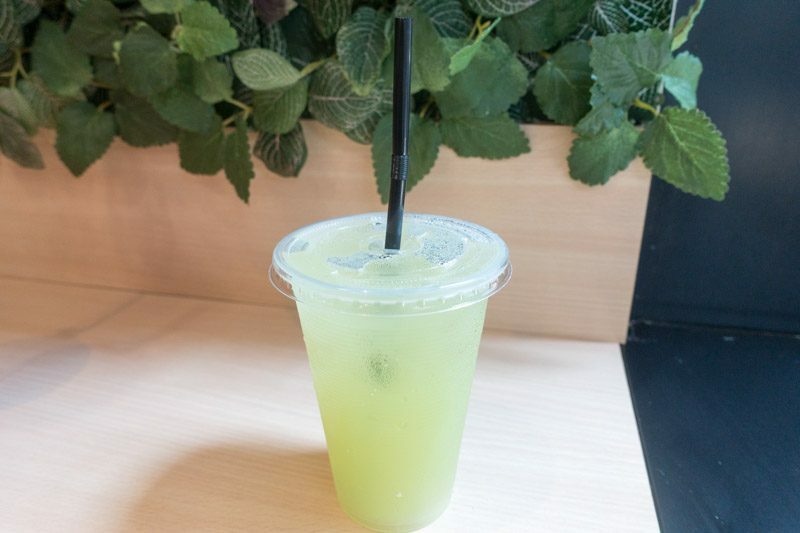 It tasted like a mix between lemonade and lime juice, and was really thirst-quenching. I loved how the acidity and slight sweetness of the MoB Refresher cleansed my palate. It also helped to cut through the meatiness from the Ramly burger patties. It goes without a doubt that Ministry of Burgers serves up a mean Ramly burger. The patties were juicy and thick, the sauces used were generous, and the egg wraps were delicately thin and soft. While the four-patty Ramly burger isn’t something I’d finish by myself, it’s a delicious burger to share with friends and family. I’ll definitely drop by again the next time I’m craving a classic Ramly burger!